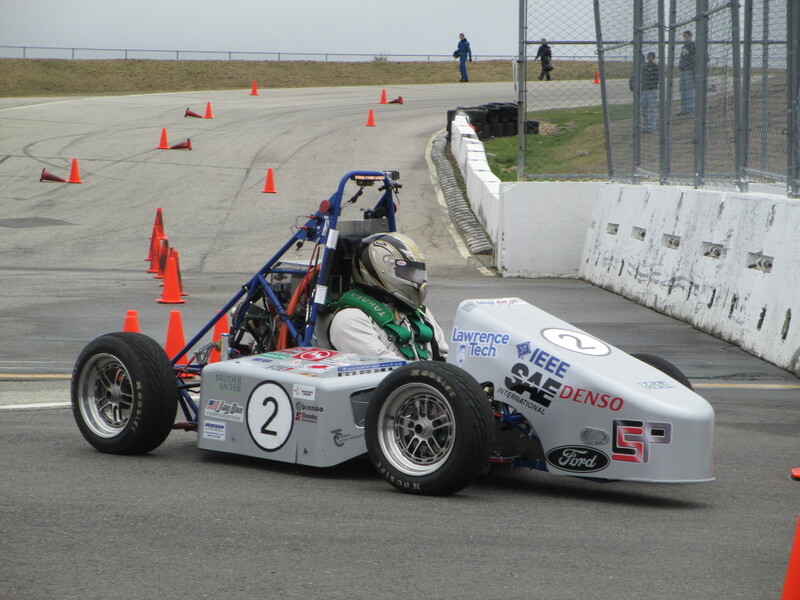 Lawrence Tech’s Formula Hybrid racing vehicle makes a turn at the New Hampshire Motor Speedway. LTU finished first in the Autocross race and second in Endurance race. It ended up with 253.63 points, just eight behind the University of Idaho in the 12-team Hybrid Drive Class for vehicles that can run on both gasoline and electricity. Dartmouth College won the seven-team Electric Drive Class. Lawrence Tech could have overtaken Idaho with two more laps in the Endurance race, but fell short when the spokes on the right rear wheel broke after 16 laps, putting the LTU vehicle out of commission. LTU also missed a chance to pick up points in the Acceleration racing competition because the team had not yet resolved an electrical grounding problem that plagued most of the teams using the grounding system recommended by the event organizers. That turned out to be a very high hurdle this year. The only two teams that competed in the Acceleration and Autocross races were Dartmouth College, the host for the event, and the University of Vermont, which finished first and second, respectively, in the Electric Drive Class. LTU crossed the finish line first when it went up against those two teams in the Autocross competition, and also finished ahead of them in the Endurance race, which was won by the University of Michigan. Completing the Autocross race was the high point of the four-day competition for the LTU team. But that was quickly followed by the low point when the team was disqualified on a technicality. The judges had allowed LTU to run in the race with only preliminary approval in the electrical inspection, but another team filed a protest because the judges had failed to post this alteration of the race entry standards, as required by the competition rules. The loss of 150 points for LTU allowed the University of Idaho to take first place in the Hybrid Drive Class without completing a single lap around the track. The Formula Hybrid Competition sets a very high standard for racing. Only five of the 21 teams in the two divisions answered the bell for the Endurance race finale. Yale University, which edged out LTU for first place in the Hybrid Drive Class last year, also failed to make it around the track and finished fourth this year. The wheel failure was symptomatic of the financial challenges LTU faces when competing against much larger universities. LTU was still using wheels salvaged from the 2010 racing vehicle because there were limited funds in the budget for new equipment. Because of the high stress and loading on equipment in a racing environment, it is suggested that racing teams use new wheels every year. “Racing is expensive, and we appreciate our corporate sponsors and all those who contributed money and materials to our team,” Fletcher said. The LTU team that competed in New Hampshire included John Agrusa, Jim Cass, Joe Falzon, Matthew Haggard, Donald Henderson, Zach Ketner, Jared King, Matt Moyer, Eric Onan, Nicholas Pakledincz, Joe Polizzi, Adam Tallman, Ryan Tietz, Dan Victorson, and San Wong. The Formula Hybrid International Competition for college students was founded by the Institute of Electrical and Electronics Engineers, SAE International, and the Thayer School of Engineering at Dartmouth.